Our scheduled guest, Jacquie Gering, is experiencing health issues and will not be able to come to Victoria. We are cancelling our May 25th MQG meeting, although we will be at a table in the 6 Mile Pub from 7pm onwards. Please join us for a purely social event. See you at the June 15th meeting or at the June sew-in. for an unforgettable evening with Jacquie and all of her fabulous quilts. 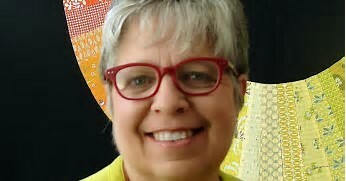 Her lecture/trunk show titled "Modern Quilting, Honouring Tradition" will be approximately 60 minutes long with time to gather around close up and personal. • Jacquie will autograph books if you bring them! • There will be no show and share for this meeting as we would like to take the opportunity to have as much time with Jacquie as possible. • Block lotto, 50/50, door prizes, round robin, and our library will still be operating as normal and we will be keeping our regular meeting extremely short. As always, what a talented bunch of folk you are! Marg made this super wallet in the workshop with Jill Spyker. Susan won the block lotto in November. Quilted by Jennifer Watson. A quick look at the back. Susan also made this quilt using the charms from the peach/lime/turquoise charm swap last fall. Anne co-ordinated the swap with Susan and this is her quilt. Anne made this super cute animal friends quilt. Pattern from HERE. Pat's satellite group pools their blocks for the lotto together; she won her group's batch and made this quilt! Audrey took the Rebecca Bryan workshop and finished her triangle quilt. She quilted it using quilt as you go; this is the back. Sharon is a quilting machine! Here's a baby quilt for a co-worker's baby. Dawn made this sweet quilt for another baby. Mary made this one from "Sunday Morning Quilts"
Esther made this for her son who works for Ableton Music. This is their logo. Natalie made this for the Riley Blake Rockstar fabric challenge. Jay made this hexie mini as a name tag to wear around the IQF Chicago show where her millefiori quilt was juried into the show. Laura and two table runners. Marianne and another quilt as you go improv piece. This was inspired by a Beth Ann Ash book. Netta made this golden rectangle/golden mean quilt. She made it at St Patrick's day and happened to find shamrock fabric in her stash! Kate with her finished improv quilt. Say it with me now, and the back! Kate also made this fantastic improv quilt. This is why we have quilt friends! Darlene made her wallet at the Jill Spyker workshop which happened just a couple of days after her car was stolen. Very upsetting of course but sewing for the day with friends who love fabric helped Darlene feel better. She shared the whole story at guild meeting and got quite a few hugs at the break afterwards! Stacie and her Canadian flag pillow. And HER wallet from the Jill Spyker workshop. And something rainbow for another swap thing. The second half of the meeting was Quilt Jeopardy! which was so much fun for everyone. Kelly won the wonky star block lotto! Come join us on Saturday, May 13th from 12:00pm to 4:00pm Bring your project, maybe a snack and come sit and sew with new friends! Everyone is welcome, you don't have to be a member to sit and stitch! We do have a small cost of $7 to cover the room rental.